How does it work: The NEW YEARS EVE CLUB CRAWL 2014 is easy and simple. Party at 4+ of Toronto’s hottest parties and venues with 1 VIP Wristbands.Your ticket & VIP Wristbands enable you to club crawl and club hop between all 4+ venues, 4 different New Years Eve Themes by following hosts until we reached our last stop for the night and the best part, all venues are walking distance. Each venue will have a variety of different music, DJ’s and MCs. The party will start at TRYST and will finish off at FICTION NIGHTCLUB. Your wristband give you no cover part of the New Years Eve Club Crawl by following the group. Your wristbands are the only way in without paying cover or waiting in line. Limo buses start to depart at 9pm sharp, don’t worry if you missed your departure buses will be rolling back until 930pm at TRYST Nightclub to pick up anyone who missed the bus or arrived late. VIP General Admission holders will follow our VIP Hosts to each destination starting at 930pm. The night will begin at TRYST Nightclub located Party on 2 floors, heated patio. Guest DJ’s playing all your top tunes. Please make sure to arrive early. Doors open at 8pm sharp, wristbands given out until 9pm. 2 Floors, 2 Sounds as we say goodbye to 2014 and ring in 2015. Wristbands are only available at the starting location- TRYST NIGHTCLUB on December 31 between 8pm-9pm. Doors will open at 730pm. Wristbands will not be given out passed 9pm and will not be available at any other destination. If you can’t make it at the starting location, we advise you get someone who is attending the event to pick up the wristbands for you and you can join in at the location we arrived to. A- Once you have received your wristbands you will get VIP treatment at each venue. Simply show your wristband at the venue and you will get no cover, no line during the club crawl by following the group. Our super fun party hosts will lead the way to the different locations and party bus ticket holders will have party bus transportation between venues starting at 9pm. A- Buses will leave from TRYST at 9pm sharp, Please arrive early to receive your VIP Wristbands. Each bus will have a different route heading to all the venues part of the club crawl and ending at FICTION. A- All Clubs Are Around a 30seconds-2Minute Apart. Simply Crawl, Stomp, Walk Or Run for general admission holders by following our hosts.All wristbands holders will follow as a group to all venues part of the club crawl, your wristbands will have the list of venues in order. 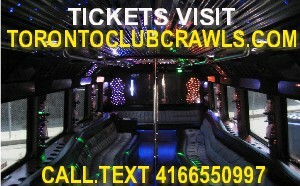 VIP Limo Bus & Party Bus tickets will have transportation between all nightclubs. Announcements and hosts will let everyone know when its time to leave. A- Because its New Years Eve all venues will be at capacity and it is recommended to stay at your location. A- VIP General Admission gives you all the same benefits- no cover, no line, etc but without the party bus so you may club crawl to the destinations during its hours without the bus and VIP Party bus simply gives you VIP transportation without walking.